Edward McKeen, a Covenanter, was shot in February 1685. A company of twenty-four soldiers surrounded Dalwyne farm, north of Barr, where they discovered McKeen. He had travelled from Minnoch vale in Galloway. McKeen tried to escape and was shot twice in the head by Cornet Dundas. The small headstone is located near the centre of the old churchyard. It is now positioned on a larger modern base stone. 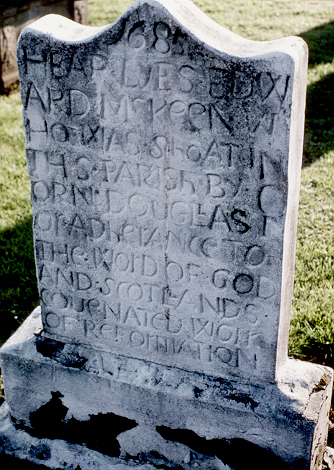 The inscription notes that MacKeen was shot by Cornet Douglas, but this is an error. He was shot by the soldiers under Cornet Dundas.